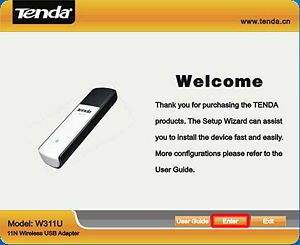 Micro Center Tech Support: Having problems installing your wireless Tenda W311U USB adapter?? 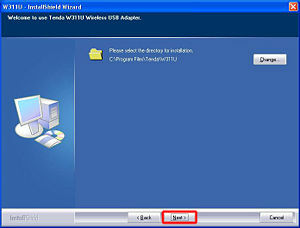 Having problems installing your wireless Tenda W311U USB adapter?? 1. Start by inserting the Wireless USB Adapter into the USB port of your computer. You will see the following in the lower right hand side near the time. 2. 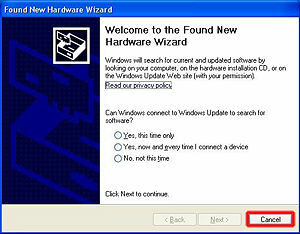 "Found New Hardware" dialogue window will appear, select Cancel. 3. Insert the included CD-ROM into the optical drive of your computer and the "Welcome" screen will appear, select Enter. 4. "W311U - InstallShield Wizard" dialogue window will appear, select Next. 5. "W311U - InstallShield Wizard" dialogue window will appear with directory installation location, select Next. 6. "W311U - InstallShield Wizard" dialogue window will appear to confirm installation location, select Next. 7. "W311U - InstallShield Wizard" dialogue window will appear to finish the installation, select Finish. Now that the installation is complete all that is left to do is double click on the Tenda icon by the time and select your network. Note: If your network is secured you will have to enter the security key the first time you connect.